Financial Income declined by 73% to total $11,000 from $40,000 in August 31, 2017. An exchange loss of $28,000 was realized relative to $132,000 gain for the corresponding period in 2016. Group Operating Expenses totalled $1.03 million as at August 31, 2017 relative to $1.3 million for the corresponding period in 2016 a 20% decline. The company reported net loss of $1.05 million, this compares with the loss of $1.13 million in 2016. Net loss per share was 0.19 cents for the quarter ended August 31, 2017 (2016: loss per share of 0.21 cents). The trailing twelve months loss per a share is 0.67 cents. The number of shares used in the calculations is 546,000,000. Total current assets as at August 31, 2017 amounted to $52 million, down from $57.23 million as at August 31, 2016. The main reason for the decline in total asset was Resale Agreement. Resale Agreement for the year totalled $2.40 million, 67% less than the $7.34 million reported in 2016. 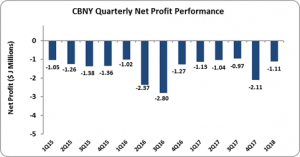 Shareholders’ Deficit amounted to $48.78 million, an increase relative to the $43.55 million deficit reported in 2016, resulting from the increase in Ciboney’s accumulated deficit from $424.42 million to $419.20 million. As such, the shareholder’s deficit per share stood at 8.93 cents as at August 31, 2017 (2016: 7.98 cents).